Messier 13 (M13), also known as the Great Globular Cluster in Hercules, is a globular cluster located in Hercules constellation. Messier 13 is one of the brightest and best known globular clusters in the northern sky. The cluster has an apparent magnitude of 5.8 and lies at a distance of 22,200 light years, or 6,800 parsecs, from Earth. Its designation in the New General Catalogue is NGC 6205. The Hercules Globular Cluster has an estimated age of 11.65 billion years and contains about 300,000 stars. The estimated mass of the cluster is about half a million solar masses. M13 stretches across 20 arc minutes of the sky, which corresponds to a linear diameter of 145 light years. The cluster can be seen without binoculars in exceptionally good viewing conditions, with clear skies and no light pollution. The brightest star in M13 is V11, a red giant classified as a Cepheid variable. V11 has a visual magnitude of 11.95 and lies approximately 25,100 light years from Earth. The Hercules Globular Cluster contains an unusually young, B2-type star, designated Barnard 29. The star does not really belong to the cluster, but was presumably picked up by M13 on its orbit around the Milky Way. Other stars in the cluster are very old and only have about 5 percent of the Sun’s iron content as they were formed before the stars in our galaxy created metals. 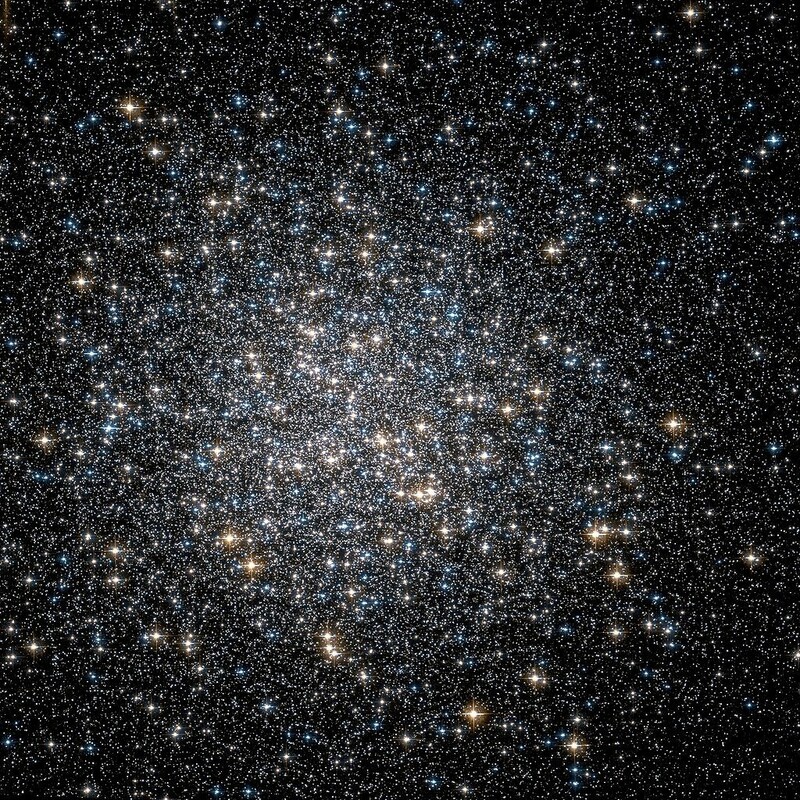 M13 also contains about 15 blue stragglers, old stars that appear younger and bluer than their neighbours. 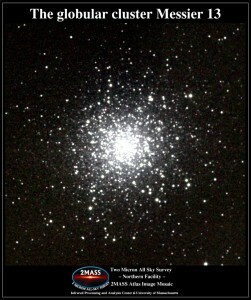 Messier 13 is a class V globular cluster, one with an intermediate concentration of stars toward the centre. It has a densely packed central region, with up to a hundred stars populating a cube only 3 light years on a side. To illustrate: Alpha Centauri, the nearest star system to Earth, is just over 4 light years away. In other words, stars in the cluster’s core region are about 500 times more concentrated than those in our immediate stellar neighbourhood. It is nearly in a Right Line with Zeta and Eta of Bayer, somewhat nearer to Zeta than to Eta: and by comparing its Situation among the Stars, its Place is sufficiently near in [Scorpio] 26 deg 1/2 with 57 deg 00. North. Lat. This is but a little Patch, but it shews it self to the naked Eye, when the Sky is serene and the Moon absent. In the night of June 1 to 2, 1764, I have discovered a nebula in the girdle of Hercules, of which I am sure it doesn’t contain any star; having examined it with a Newtonian telescope of four feet and a half [FL], which magnified 60 times, it is round, beautiful & brilliant, the center brighter than the borders: One perceives it with an ordinary [non-achromatic] refractor of one foot [FL], it may have a diameter of three minutes of arc: It is accompanied by two stars, the one and the other of the ninth magnitude, situated, the one above and the other below the nebula, & little distant. I have determined its position at its passage of the Meridian, and compared with the star Epsilon Herculis; its right ascension has been concluded to be 248d 18′ 48″, & its declination 36d 54′ 44″ north. It is reported in the Philosophical Transactions, no. 347, page 390, that Mr. Halley discovered by hasard that nebula in 1714: it is, he says, almost on a straight line with Zeta & Eta according to Bayer, a bit closer to the star Zeta than to Eta, & when comparing its situation between the stars, its place is rather close to Scorpius 26d 1/2 with 57 degrees Northern [ecliptical] latitude, it is nothing but a small patch; but one sees it well without a telescope when the weather is fine, & if there is no light of the moon. On September 9 , with the 7-foot telesope, I found a very distinguishable nebulous star in Hercules between Eta and Zeta, which shows up as a rather vivid and round nebulous patch, which has a bright nucleus in its center. Actually, it is situated between two small stars, and is separated from the Northern one by 17.25′ and from the Southern one by 16.75′, as the third figure shows. From the star Zeta, I find with the heliometer a separation of 4deg 59′, from Eta 2deg 29′, from Pi 6 deg 43′, and from d 4deg 57′. It was only partially known to me at that time that Halley has observed a nebulous star in Hercules, and later I read in the Philosophical Transactions of the year 1716 that he had observed it in the year 1714 between Eta and Zeta at about 236 deg [ecliptical longitude] and 57 deg northern [ecliptical] latitude; therefore, it has to been assumed that this must be the same one. Meanwhile Halley writes that the nebula is a bit closer to the star Zeta than to Eta. As I now find that it is situated [much] closer to the star Eta than to Zeta, I don’t know another reason responsible for this remarkable difference than a typing error at Halley, or his inacurate estimate of the position given by longitude and latitude. This brilliant cluster was discovered by Halley in 1714; and fifty years afterwards it was examined by M. Messier, with his 4-foot Newtonian, under a power of 60, and described as round, beautiful, and brilliant; but, “ferret” as he was in these matters, he adds, “Je me suis assuré qu’elle ne contient aucune étoile.” This is rather startling, since the slightest optical aid enables the eye to resolve it into an extensive and magnificent mass of stars, with the most compressed part densely compacted and wedged together under unknown laws of aggregation. In 1787, Sir William Herschel pronounced it “a most beautiful cluster of stars, exceedingly compressed in the middle, and very rich.” It has been recently viewed in the Earl of Rosse’s new and powerful telescope, when the components were more distinctly separated, and brighter, than had been anticipated; and there were singular fringed appendages to the globular figure, branching out into the surrounding space, so as to form distinct marks among the general outliers. The Hercules Globular Cluster was the target of the Arecibo message, a message beamed from the Arecibo Observatory in Puerto Rico in 1974, which contained information about the human race, Earth’s location and other data. The message was sent from a radio telescope in the direction of M13 as a way of potentially contacting extraterrestrial civilizations. However, the message will never reach its target. It will arrive at the past position of M13 in about 25,000 years, but the cluster will no longer be there at that point. Messier 13. Atlas Image mosaic obtained as part of the Two Micron All Sky Survey (2MASS), a joint project of the University of Massachusetts and the Infrared Processing and Analysis Center/California Institute of Technology, funded by the National Aeronautics and Space Administration and the National Science Foundation. 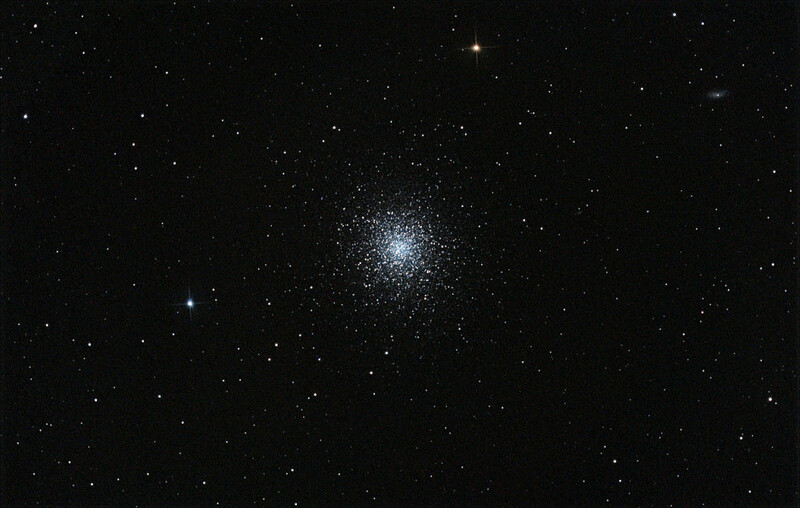 Messier 13 can be easily seen in a small telescope. The cluster is located near NGC 6207, a 12th magnitude galaxy seen edge-on. The galaxy can be seen 28 arc minutes northeast of M13. Another galaxy, IC 4617, lies between the two, to the north-northeast of M13’s centre. 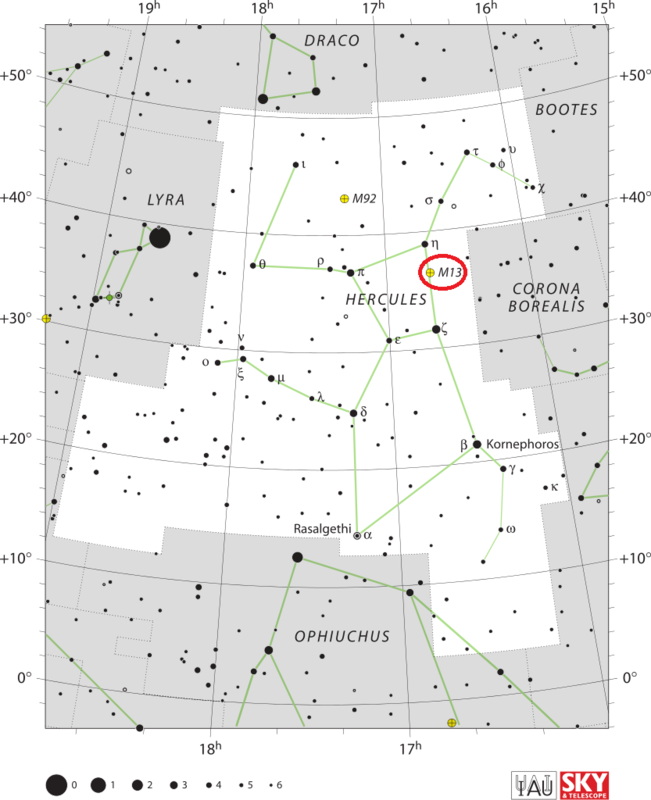 Messier 13 lies within the Keystone, a familiar asterism that marks the torso of the celestial Heracles, about one-third of the way from the bright star Vega in Lyra constellation to Arcturus in Boötes. Both these stars are prominent in the spring and summer sky in northern latitudes. The four stars that form the Keystone are Eta, Pi, Epsilon and Zeta Herculis. M13 lies between the stars Eta and Zeta Herculis, about 2.5 degrees south of Eta. To the naked eye, the Hercules Cluster appears as a fuzzy star. Binoculars will reveal a comet-like hazy patch with a clear centre, while 4 to 6-inch telescopes will begin to resolve the stars in the cluster. Instruments with larger apertures will resolve stars across the entire cluster. 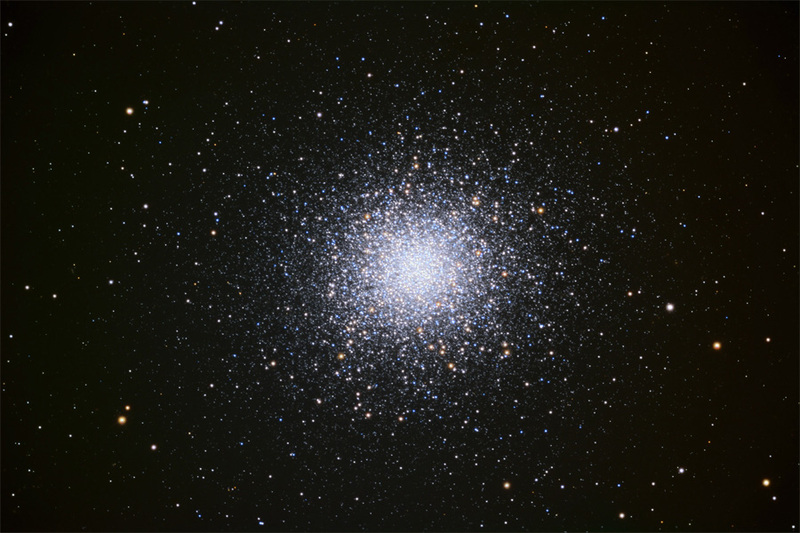 Messier 13 is best seen from May to September. It is particularly high in the sky in the summer months.